Many Australians still think of the Queensland capital as a cultural backwater. Although it's Australia's third largest city, the memory of conservative premier Joh Bjelke-Petersen still casts a shadow. Once every three years Brizvegas hosts one of the world's biggest arts events, the Asia Pacific Triennial (the sixth is abbreviated to APT6). Gathering works from Iran to Hawaii, one gallery isn't enough to hold the exhibition so it rambles through the Queensland Art Gallery (known unprosaically as QAG) across to the Gallery of Modern Art (or GoMA to his old army buddies). Entitled People holding flowers, this years coverboys decorate most promo materials, marching across the gallery floor. 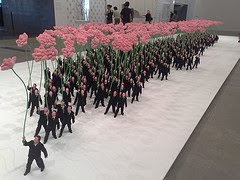 Chinese artsists Zhu Weibing and Ji Wenyu created the seriously dressed businessmen each holding aloft a lotus flower to play on Mao Zhedong's Hundred Flowers campaign of encouraging artistic opinion. Ironically the flowers and their bearers are identical much like political thought after Mao's crackdowns on the campaign after 1957. Elsewhere Taiwanese artist Charwei Tsai has created Mushroom Mantra, a living garden of mushrooms each inscribed with the Bhuddist Heart Sutra. It's a strong argument for a living religion as each mushroom needs to have the sutra re-written by the Brisbane's own Chung Tian Temple as the fungi grow. Many of the works tackle global problems. 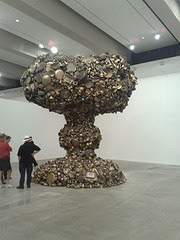 Take Subodh Gupta's Line of Control (1), an enormous pile of brass cooking pots shaped into a mushroom cloud. The Line of Control divides India from neighbouring Pakistan and the artist is pointing to nuclear tests that both nations indulged in until they became commonplace along their shared border. It's a gutsy piece of art that catches the eye while stabbing at the heart. APT6 is no stuffy exhibition that pushes viewers away or waggles fingers at snapshot takers. Lots of the crowd when we visited looked into Yoshitomo Nara's custom built van that was loaded up as a mobile studio for making his cute-but-creepy characters. Elsewhere there's a pile of paper planes made by little patrons of the arts from recycled materials with the best suspended from the roof or hung from the walls. 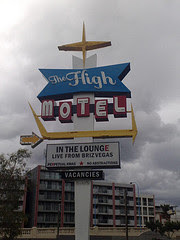 This Brisbane is a long flight from Bjelke-Petersen's parochial Queensland. The APT6 would have bugged the former premier who in a Mao-like fashion banned public protest and narrow-mindedly ranted "What's good for Queensland is good for Australia." The APT6 involves Australia in the world's most important political and social debates from a place that's anything but a backwater. It could even make a claim for Australia's most outward looking city. What's good for the world has become good for Brisbane. I do so love those guys with the poppies! Those really look beautiful, there's definitely lot's of good Asian artist. Thanks. Can I just say what a comfort to find someone who genuinely understands what they are talking about on the net. You certainly understand how to bring a problem to light and make it important. I like the photo of the Taiwanese artist Charwei Tsai who created Mushroom Mantra, a living garden of mushrooms each inscribed with the Bhuddist Heart Sutra.